St. George, a.k.a. ‘”he Dragon”, a.k.a. George Bailey (seriously? ), is an ex-hero. Just a year before, he was the darling of humanity, saving the innocent from the not so innocent of Los Angeles and making headlines everywhere he went. Whether rescuing a woman from being raped in an alley, smacking around some gang bangers on the prowl, or attempting to deal with a strange biological outbreak that re-animates the dead, he was the best at what he did. And what he did was be a hero. Invulnerable, invincible, the result of a freak lab accident, the Dragon kept the city from falling into anarchy, aided by a cadre of fellow super-humans, all of whom developed their powers in the recent past. There was Gorgon, whose gaze would tap the life force of others and convert it into super strength. Zzap, a cripple, confined to a wheelchair, capable of becoming a being of pure energy, blessed with all the powers of a God. Imagine the Sun with a personality. Cerberus–a girl and her power armor. The Regenerator—I think that one would be self explanatory. And then there was Stealth, the supermodel vigilante, combining genius level intelligence with supermodel level sensuality. I did say ex-heroes though, didn’t I? What happens to a hero when all he (or she) has vowed to protect is gone? When the situation goes from bad to worse (to worst) and it’s no longer a matter of keeping humanity safe, but rather keeping humanity alive? And what could possibly bring such a situation to pass? Peter Clines’ EX-HEROES answers those questions with one answer. Yep, you guessed it…the answer is Zombies. 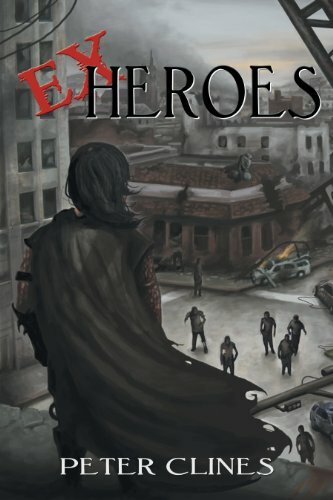 Bouncing back and forth between the times before and after the zombie apocalypse, EX-HEROES chronicles the exploits of those few super heroes that have managed to survive (they’re not the only “ex-heroes” in this story), trying to maintain a small enclave of humanity that remains uninfected. Day by day they struggle against the hordes of undead clogging the streets of Los Angeles, ever watchful for the appearance of their undead brethren. Dead superheroes have no control over their powers, but they have them nonetheless. At the same time, several of their members are trying both to trace the source of the outbreak and to find a cure (or at least a vaccine) for those who are left. They’ve known for some time that if you die—you turn. What they don’t know is that one of them has intimate knowledge of how the outbreak began. Complicating their search is the competition, a loose coalition of former gangs united under the aegis of “The Seventeens” who have fought tooth and nail with the heroes for the spoils of a dead civilization. So far, it’s a dead heat. When my copy of EX-HEROES arrived in the mail, I got a little worried. Wrapped in an almost amateurishly bound trade paperback, it appeared as though I had been snookered into reading another author’s self-publication. Thank God I got beyond that. What I found inside was a first rate blend of apocalyptic zombie fiction, combined with some good old fashioned super-heroism. When I say old fashioned, I don’t mean to imply that the heroes are black and white cookie cutter caricatures—they’re real people, simply blessed with extraordinary abilities. As is the fashion these days, the lines between good and evil are blurred, and no character is without flaw. Whether it’s Stealth’s lack of empathy, or the Regenerator’s apparent cowardice, Clines treats his superheroes as flawed beings–much like the rest of us. Hell, some of them aren’t even likeable—but then who said superheroes had to be nice? Of course, like every good zombie novel, there’s a twist, which I’ll leave you to get to on your own. Once you’re done with this zombies vs. superheroes mash-up, never fear. The fun continues in Cline’s sequel, Ex-Patriots.